These summer vegetable bowls are loaded with some of the season’s best ingredients. 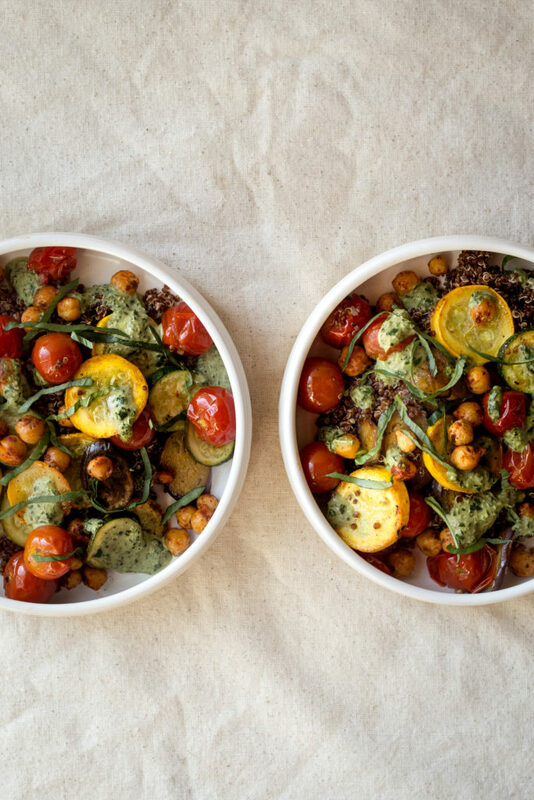 Roasted summer produce is tossed with quinoa and topped with crispy pan fried chickpeas and doused with a zesty basil tahini sauce. Simple, delicious and filling to boot! I love the flavors of the season and hope you all enjoy this simple recipe as much as we do. Pair with a glass of crisp white wine for a delicious weeknight meal. Preheat the oven to 425F. Toss all the vegetables with the olive oil and place on a rimmed baking sheet. Sprinkle with plenty of salt and pepper and roast until the veggies are tender and lightly browned, about 20-23 minutes. Toss halfway through cooking. Prepare the chickpeas by tossing the spices, nutritional yeast, and salt in a bowl. Set aside. Heat the oil in a large skillet over medium high heat. Add the chickpeas and sauté, stirring frequently, until golden and crispy, about 15-18 minutes. Use a slotted spoon to transfer the chickpeas to a paper towel lined plate to drain. After the chickpeas have drained add them to the bowl with the spices and toss to coat. Prepare the sauce by whisking all the ingredients together until smooth and creamy. This works best with a blender or small food processor. Taste and adjust seasonings as needed. Add more water to thin the sauce if need be. Toss the roasted veggies with the cooked quinoa and squash blossoms (if using). Divide between bowls and drizzle with the sauce and top each portion with the fried chickpeas. Garnish with minced basil and season to taste with salt and pepper. Made this tonight in my galley kitchen. Came out great! I am becoming a tahini lover thanks to this sauce. And the crispy chic peas add that perfect amount of spicy crunch!